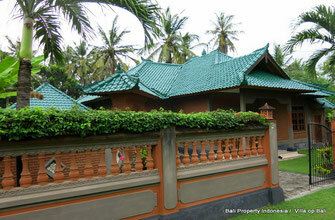 On this page you will find a directory of our properties on offer for sale in West Bali. To go to the page of the property of your interests, please click on the pictures of that certain property or click on the button that says “More information”. The beachfront property consisting of a one-bedroom villa and guesthouse for 4-6 persons is located on a plot of 3.840 sqm. 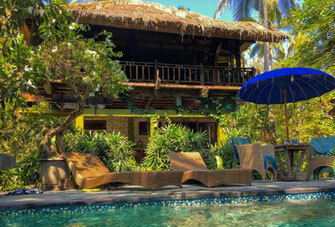 This Balinese-style villa is part of Bali which is not touristic. However, it is a lovely place 100 meters from the beautiful beach. Do you have the pioneering feeling in you? And is it also your wish to set up a resort in Bali? Then this is the best choice you can make. A beachfront Joglo resort in West Bali. 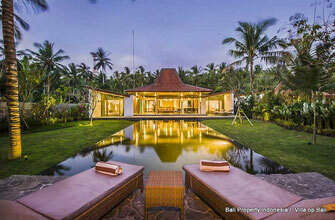 On offer for sale in the West of Bali, a 3 Melaya bedroom absolute beachfront Joglo style villa on a plot of 2000 sqm of land. A villa with views over the ocean and to Java.